Sam and Charlie have been together over a decade, and their commitment to each other has only grown stronger through the years. But love isn’t always easy, and eighteen months after a violent assault, their relationship is struggling. Charlie can’t shake the lingering fear of attracting more violence by displaying affection, and he’s angry at himself for not getting past it. Sam would do anything to help Charlie feel better—if only he knew what to do. The century-old farmhouse in Northwest Oregon is the perfect place to spend the holidays with Sam’s family, but it was their refuge after the attack, and it still holds painful memories of those difficult first months. Christmas should be a joyful time, but even being surrounded by people who love him isn’t enough to make Charlie feel safe. They agreed not to exchange gifts but Sam has a surprise planned that he hopes will make everything merry and bright. But he may end up more surprised than Charlie. I grabbed this story because it was offered for free (between December 1st – 7th, 2014) by the author who decided to republish her first M/M story that was previously released by a now-defunct publisher. I thought the cover was soothing and I am always intrigued with stories featuring established couples. I mean, it’s easy to think about happily ever after but is it really? What happens when it is not? How will a couple deal with that? My first experience with Charley Descoteaux’s writing was for her free short story contribution of the M/M Goodreads “Don’t Read in the Closet” event, Better Than New. I knew she published several stories before but I’d never read anything by her before. I enjoyed the sense of intimacy in that story that I decided I wanted to read another story by her. Then I stumbled into this one. Okay, writing style wise … there was a quality of tight but tender prose that I could see myself being familiarized with – although I don’t know if it works for longer length. The way Descoteaux wrote about Sam and Charlie made me feel assured that they were solid, even if Charlie seemed to experience trauma after the horrible incident that happened to him 18 months ago. I was certain that these two loved one another. Sam’s family members sounded colorful and interesting to be with; I was definitely loving how the couple interacted with Sam’s older sister and her son. Unfortunately because the story was short and practically started in the ‘middle’, I felt like I was missing a closer and deeper connection with Sam and Charlie. I would like to have a prequel or at least maybe one or two previous chapters, especially related to the incident and maybe more background of Sam’s family members (the part with his sister’s husband was intriguing!). Because at this point, I felt a little bit lost in the journey. So it was touching but rather incomplete as a story. The free offer has actually finished, but it’s only 77p if any one is interested – the price of a good chocolate bar, personally I would want the book! 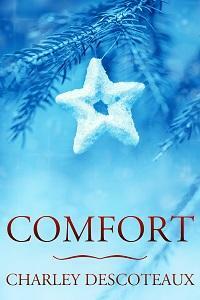 This entry was posted on December 5, 2014 by Ami in Contemporary, Genre, Reviewer: Ami and tagged 3.5 Stars, charley descoteaux, Established Couple, holiday, hurt/comfort, self-pub.